Coach Jeff Rayburn is the Head Football Coach at Lone Star High School. Over the past 5 years Lone Star has gone 51-14 winning 11 playoff games and playing in the 5A DII State Championship in 2015. During those 5 years he has been named NFF Gridiron Coach of the Year, Don Shula National Coach of the Year nominee, Dallas Cowboys Coach of the Year, DMN Coach of the Year and Collin County COY. Coach Rayburn received his Bachelor of Science in Education from the University of Oklahoma. Coach Rayburn previously coached at Duncanville, Haltom and Hillcrest high schools. Jeff is happily married to Candice and they have two children, a daughter Campbell and son Cade. Coach Rayburn enjoys spending time with his family and working out. Darren Kight is the defensive coordinator and inside linebackers coach. Darren played football at Angelo State University where he earned his Masters of Science in Kinesiololgy. 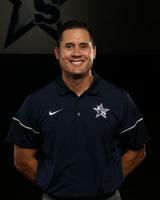 Darren previously coached at Angelo State, Howard Payne, Round Rock Stony Point, Round Rock Westwood, and Georgetown. Darren and his wife, Jill, have two children, Kyndall and Cooper. Darren enjoys hunting, fishing, golf, and spending time with his family. Mark Humble is the Offensive Coordinator and Quarterbacks coach. Mark was part of a State Championship team at Killeen High School, went on to play quarterback at SMU while earning his Bachelor of Arts degree in History & Communications. He began his 3 year college coaching career at SMU coaching Running Backs while earning his Masters Degree. Mark comes to Lone Star with 20 years of coaching experience and 17 years of teaching experience. Coach Humble most recently comes as the Offensive Coordinator from Southlake Carroll with previous coordinating stops at Plano East, Texas High, Keller High School and Grand Prairie High School. Mark is happily married to Kerri and they have two children, Kaylee and Hudson. Coach Humble enjoys spending time with his family, traveling, fitness, reading, loves music and movies. Jon Alvarado coaches the Outside Linebackers. Coach Alvarado earned his Bachelor of Arts in History at Midwestern State University where he played Cornerback. Jon comes to Lone Star High School with 14 years of experience as a high school and Middle School football coach and teacher. Prior to joining the Ranger Nation, Coach Alvarado with the Safeties at McKinney North High School. Coach Alvarado is happily married to wife, Shannon for 11 years. They have two boys Jayden who is 9years old and Camden who is 2 years old. Doug Jones coaches the Offensive Line. Coach Jones earned his Bachelor of Science in Kinesiology at Midwestern State University where he played Defensive Line. Doug comes to Lone Star High School with 14 years of experience as a high school football coach and teacher. Prior to joining the Ranger Nation, Coach Jones served as the Offensive Line Coach at Cameron Yoe High School in Cameron, Texas. Coach Jones is happily married to his lovely wife, Amber, and together they have two beautiful daughters, Emma and Adelyn. Barrett Earnest coaches the corners. Barrett played football at The University of Alabama from 2003-2006 while earning his bachelors of science in Kinesiology. Barrett previously coached at Lewis County High School and Brighton High School, both in Tennessee. Barrett and his lovely wife, Katie, have two kids, Lennox and Larsyn. He enjoys traveling with Katie, fishing, scuba diving, and music. Jarred Hawkins coaches the wide receivers. Jarred earned his bachelors degree in Sport Management from Texas A&M University in College Station. Jarred coached receivers at Mt. Pleasant High School for 7 years and most recently coached at Stafford Middle School in Frisco. He and his amazing wife Jonea are expecting their first child in December. In his spare time, he enjoys golf, spending time with family/friends, movies, music, and working out. Coach Spann coaches the running backs. He has coached at Center HS and Natchitoches (LA) HS with stops at the collegiate level as well. He has married to his wife, Angela for over 20 years and they have two children who attend Lone Star High School. Claire is a senior, who plays softball and Nolan is a sophomore, who plays football and baseball. Matt Fitzhugh coaches the safeties. Matt earned his bachelors degree from Texas A&M University in College Station. Matt previously coached high school football in The Colony and at Frisco High School. Matt and his wife, Helen, have two children, Brock and Reese. Kyle Mossakowski coaches the defensive line. Kyle earned his bachelor’s degree from Howard Payne University in Brownwood, Texas. Kyle previously coached at McKinney North high school. Kyle has been married to his lovely wife Jackie for 6 years and has a beautiful daughter named Avery. Coach Wheat is the offensive line coach and offensive special teams coach. Coach Wheat’s previous coaching stops include Plano East HS, South Garland HS, and Rockwall-Heath HS. Coach Wheat is a graduate of Texas A&M University. He is married to Gina and they have a son Gavin. Brandon Jackson coaches the receivers. Brandon is a graduate from the University of North Texas and received a Bachelor of Science in recreation and leisure studies with a minor in sports management. Brandon played professional football for the San Diego Chargers, Bufallo Bills, and New York Jets. Brandon also played Arena Football for the Corpus Christi Sharks. Shane Kesler coaches the receivers as an assistant. Shane earned his bachelors degree from Evangel University. He has previous coaching experience at Plano East, Glendale (MO) High School, and Fair Grove (MO) High School. Shane is happily married to Maggie. They enjoy country music concerts, traveling, and spending time with friends and family. Dr. Harper is the academic coordinator for the Lone Star Football team. She earned her Ed.D. and M.S. from Nova Southeastern University and her B.A. from William Penn University. Dr. Harper has over 20 years’ experience with advising student athletes. She has a son and daughter.